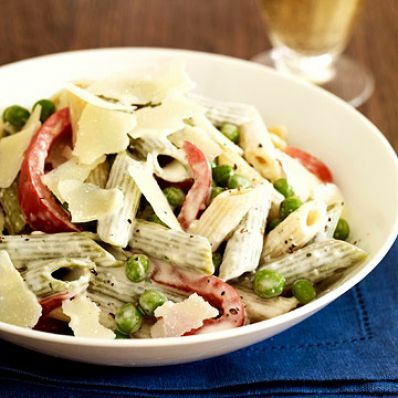 Gorgonzola and Romano cheese flavor this rich spinach and pasta dish. 1 of 3 Cook pasta following package directions in boiling salted water until firm but tender, about 13 minutes. Add peas and red pepper during last 2 minutes of cooking time. 2 of 3 Meanwhile, prepare sauce. In a saucepan, heat cream over medium-high heat. When the cream starts to simmer, stir in Gorgonzola, 1/2 cup Romano cheese, the salt, nutmeg and cayenne. Heat through, stirring until all cheese is melted and sauce is smooth. 3 of 3 Drain pasta and vegetables. Return pasta to pot and toss with the sauce. Serve pasta immediately, with additional Romano cheese, if desired.